When I finally get my stupid time machine working (it keeps liquefying the squirrels I use to test it) I think one of my first post-Hitler-murder trips will be to Volkswagen in the 1970s to convince them to build an version of the Type 181 (we called it the Thing) that can go in the water. Let me explain why. The Volkswagen Thing was one of the last of a category of car I call, cleverly, Fun Cars. These were cars, usually based on a company’s primary volume vehicle, that were stripped-down and designed as on-and-off-road recreational/utility vehicles. The Thing, based on the Volkswagen Type I platform (Beetle, Karmann Ghia, etc) is one of the best-known of these cars, and while they’re going up in value today, at the time they weren’t exactly a huge success. I mean, they did okay for what they were, but I can’t help shake the feeling that if they offered something really unique, something no one else had, they could have become their own little phenomenon. And I think that something could have been the ability to go swimming. There’s been amphibious cars sold in the US before, the best known of which is probably the Amphicar, but these were always very niche players. Amphibious cars are inherently compromises, usually being less-than-ideal cars and boats simultaneously, but it’s hard to deny the potential for fun of a car you can drive right into a lake. The one thing there never has been for amphibious cars is any kind of real mass-marketing. No major carmaker has ever seriously or in any volume tried to sell an amphibious vehicle. Volkswagen was the USA’s biggest imported brand in the early 1970s, and if they had offered an amphibious car in their lineup, it would have been by far the largest sales and marketing campaign for an amphibious vehicle ever. The reason I even think VW could have pulled this off is that from a technical perspective, VW had the experience and background in designing and building amphibious vehicles, and the VW Thing was unusually and uniquely designed that a conversion to amphibiousness would have been comparatively trivial, and based on engineering work VW had done decades before. The amphibious vehicle from VW’s past was their wartime Schwimmwagen, a name which literally means “swimming car.” With about 15,000 made, the Schwimwagen (also known as the Type 166) is the most-produced amphibious vehicle in history, and its technical specifications are, of course, very close to the production version of the VW Thing. One of the most important amphibious car technical issues — how to propel through the water, for example, could have been easily and directly adapted from the solution developed for the Schwimmwagen. To run the drop-down propeller, the Type 166 used a simple dog clutch connected right to the crankshaft pulley. The VW Thing had the same layout of engine, in basically the same location — the exact same system could be employed on a VW Thing. Essentially, you’d have a propeller unit that folded up and out of the way while driving, and then dropped down into position for water travel, engaging the dog clutch to the crankshaft when down. From there, you’d shift into neutral and just use the throttle to vary propeller speed. Easy! The bigger issue would be sealing and smoothing out the bottom. The basic Volkswagen Type I floorpan (the Thing used the slightly widened and reinforced pan from a Karmann Ghia convertible, but it’s the same idea) is already strangely boat-like in that it seals nearly the whole bottom of the car — that’s part of why Beetles have been known to float. Still, it’s not perfect, and if you really wanted to use this Thing in the water, you’d want something a bit more nautical. That’s why I think a fiberglass underpan to both seal the bottom of the car and to smooth the surface would work well. It could even have a slightly boat-like shape with a central keel-like ridge to help with directional stability, too. This pan would have holes with rubber grommets to accommodate the rear half-shafts and front control arms from the torsion-tube front axle. VW was already making fiberglass hardtops for the Thing — how much harder could something like this be? The Thing’s body already has unusually high door sills, which would help being in the water, but it’s likely all the door seals would need to be improved to be totally water-tight. The front tires would work as a rudder, as in the case of the Schwimmwagen, and there’d probably have to be a bilge pump or two stuck in the body somewhere. 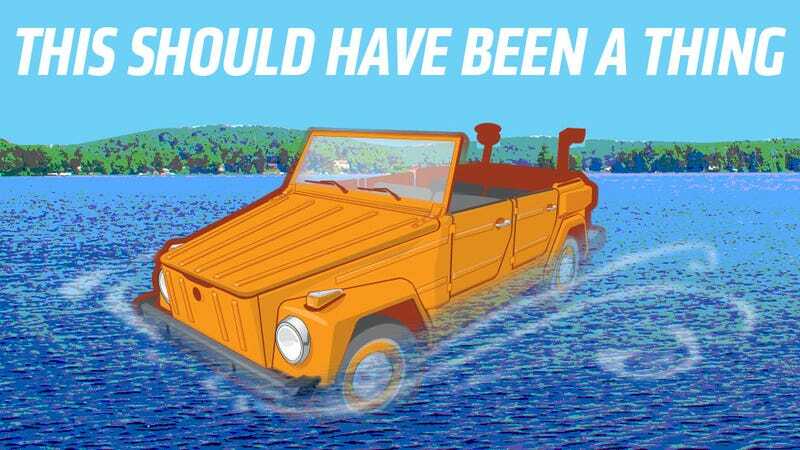 The Schwimmwagen had four-wheel drive in 1st gear, but I don’t think that would be necessary on the Swimming Thing — it would be cheaper to include a front bumper-mounted winch to provide for some backup way of getting out of especially muddy or silty shorelines. I really don’t think it would have taken all that much to turn the Thing into a recreational vehicle for land and water. I’m not saying it would make a good boat, but I bet it could be good enough to have some fun in, and that’s the whole point of the thing. If the Thing was capable of going in the water, think about what a huge differentiator that would have been compared to, say, a Bronco or a Wrangler or a Mini Moke. It would be a usable car you could take to work every day, service almost anywhere in the country, get parts for with ease, and still be able to drive it off a pier and spend a gloriously relaxing weekend tooling around a lake. Hell, the windshield even folded down, so you could lay a towel on the hood and let your delightfully ‘70s-era long-haired girl-(or boy)friend lay out and get a nice, Thanksgiving-turkey-like golden tan. Man, the more I think about this, the better an idea it seems. All of these modifications could have been added to a Thing at any point, so VW could have sold this as a sort of conversion kit. You’d pay an extra — $500 or so 1973 dollars and come out of the dealership with a car that can now be a boat? How fantastic would that have been? Maybe I’m crazy. Maybe this is a terrible idea. But the Thing is already so tantalizingly close, technically, I can’t help but imagine how wonderful the world would have been if one of the biggest car companies in the world offered an Amphibious car as an option. Think of the marketing potential — they could have called it the Swamp Thing or something! People love being reminded of swamps when they buy cars! I better get back to work on that stupid time machine. Maybe I need more lasers or something.